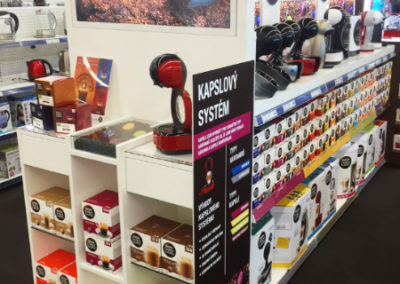 Together with Nestlé, we are improving the presentation of the capsule coffee in Electroworld stores - Dago s.r.o. 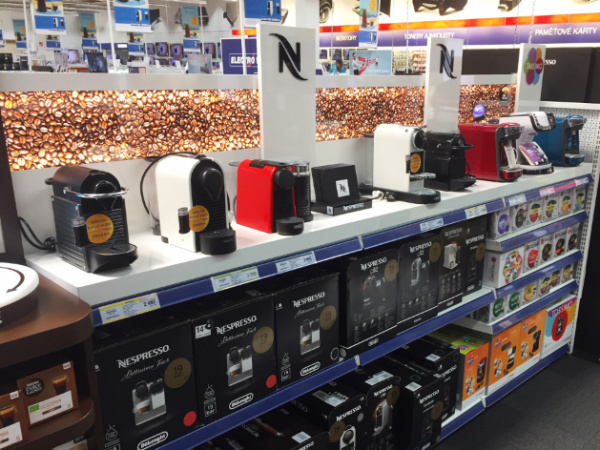 Electroworld, a retailer of electric appliances, has started redesign of the capsule coffee category in its stores. Currently, it is being tested in two stores, and there will be five more by the end of the year and remaining ones during the next year. We co-ordinate the project with the auspices of Nescafé Dolce Gusto by Nestlé. The aim of the project is to improve the clarity of the category and its more positive perception. „In competition of other types of coffee preparation, it is necessary for us that customers perceive the capsule coffee as qualitatively equivalent. 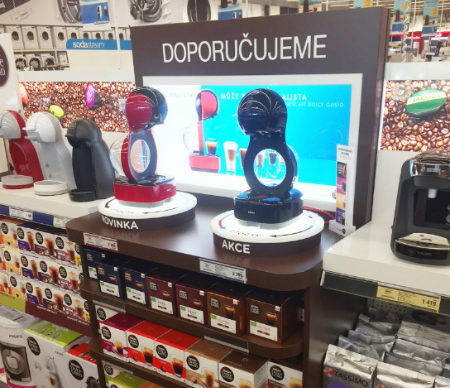 At the same time, we want our customers to be well informed about brands of appliances and capsules,“ says Michaela Gilarova, the Channel Development Specialist of Nescafé Dolce Gusto. We perceived the potential of this category and opened negotiations with particular partners. We know from previous projects that there is a potential to increase sales by up to dozens of percentages. However, its coordination is challenging, it took one year to negotiate conditions with all the engaged parties. 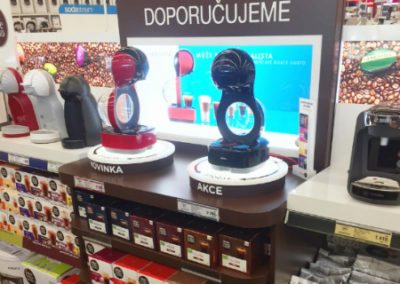 Currently, there has been carried out testing in stores in Cestlice and Nove Butovice. After its evaluation, the change will be made in other five Electroworld stores and in the subsequent year, the change will be made in the remaining ones. The trend in retail coffee is a tendency to the premium nature, when people want to enjoy coffee at their homes that will be as good as in a good coffee shop. In Electroworld, it is reflected into the white appearance of shelves and unified illuminated visuals with the motive of coffee-beans. 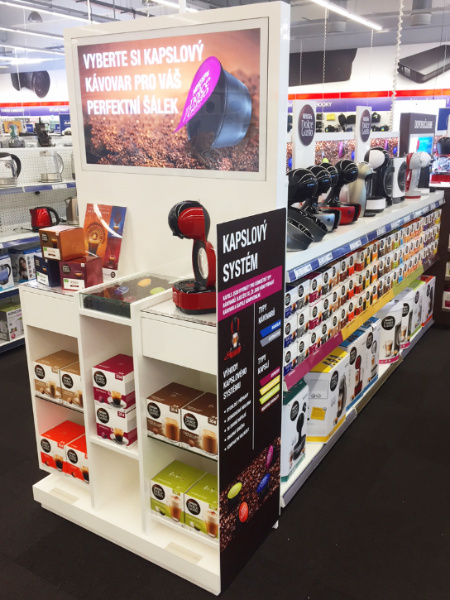 Customers are being motivated to enter the aisle by the end cap designed for action offers, where particular brands can offer coffee tasting before purchasing itself. At the centre of the shelf there is the highlighted display, so called “focal point”, with actually recommended products as novelties and action offers. It motivates shoppers to approach the shelf and offers the best of the actual offer facilitating orientation within products. Less is more, so the offer range is slightly smaller than before the realization. 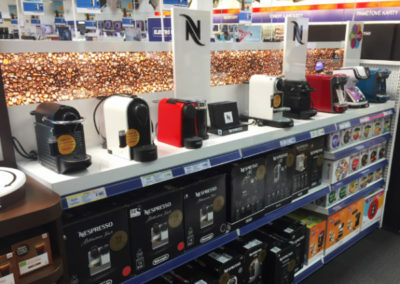 Each brand has its clearly labelled space containing coffee machines as well as appropriate capsules, which prevents purchase errors. Thanks to all these changes, the customer feels more comfortable. This has a positive impact on both shopping experience and sales.